Organoids are a promising tool to replicate key structural and functional features of human organs. Recent developments in organoids to model the liver, biliary tract, and pancreas have the potential to advance regenerative medicine. Regenerative biology is valuable for tissue renewal and replacement, but is also critical for creating models that replicate human organ physiology and functions. These models would make it easier to study the molecular and cellular features of human diseases and to develop new drugs for debilitating conditions. Organoids are three-dimensional (3D) miniature versions of a target organ. They are a promising tool to model organ function, and are poised to revolutionize medicine. Organoids can contribute to the understanding and treatment of debilitating diseases that arise in particular organ systems, but their use is fraught with challenges. 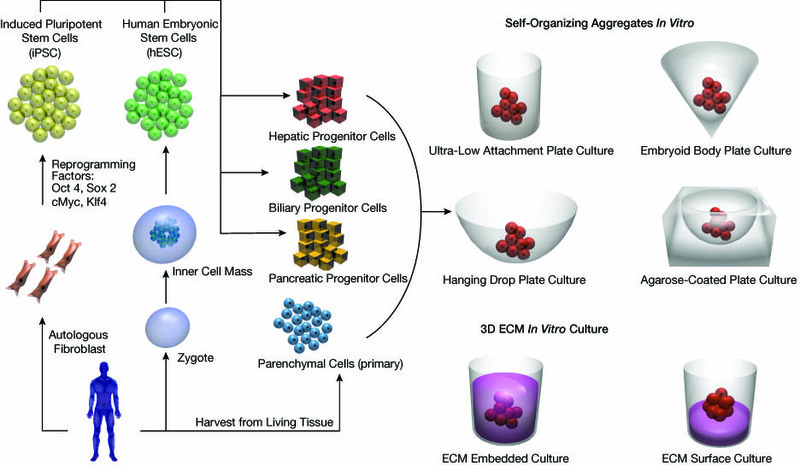 This article describes organoid biology and engineering and reviews recent progress in organoid development, with a specific focus on liver, biliary tract, and pancreas models. For years, basic research has relied on cell lines derived from human tumors, or transformed with viral genes, to model organ-specific functions. These cell lines have been a mainstay of many labs across the world, and pharmaceutical companies often employ these cell lines in studies of toxicity and efficacy and to model human disease (1). However, real organs in the body consist of primary cells, not cell lines that express a combination of normal and cancer-related genes. To develop improved physiological models, tissue engineers and scientists devised techniques to isolate multiple cell types from tissues and organs and to cultivate these cells in 2D or 3D formats. 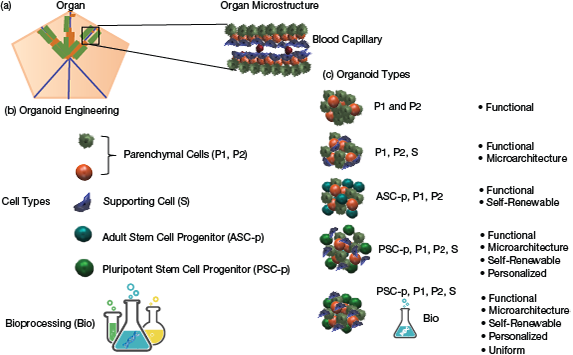 These techniques built on fundamentals of cell-cell and cell-matrix interactions and often employ both biomaterial and natural substrates (2). Researchers evaluated the implantation of tissue-engineered constructs to replace damaged organs in the clinic, with positive outcomes in some cases (3, 4). These foundational studies in tissue engineering were often limited by the cell source — primary human tissues harvested from biopsied or discarded tissues. Accompanying these developments, stem cells and stem cell engineering rapidly progressed and enabled unprecedented access to human tissues. Bioengineers developed efficient protocols for the differentiation of human pluripotent stem cells (hPSCs), which include both human embryonic stem cells (hESCs) and human induced pluripotent stem cells (hiPSCs), toward mature cells of interest. Scientists can now form many human cells of interest, model diseases in the culture dish, perform gene editing of mutant genes for disease correction, and evaluate hPSC-derived mature cells for cell therapy (Figure 1) (5). ▲Figure 1. Organoids can be developed from isolated adult stem cells or primary tissue or by differentiating and culturing human pluri­potent stem cells (hPSCs). Alternatively, personalized hPSCs can be employed for therapy after lineage-specific differentiation. Although easy to design and produce, 2D culture systems cannot physically model the 3D aspects of many organs. Even 3D culture models, which initially produced promising results (6), generally failed to fully replicate organ microstructure. Organs contain multiple cell types that display high levels of 3D spatial organization as well as repeating structural and functional units. To better recreate the repeating structural and functional units of organs, engineers and scientists have started to employ hPSC-derived progenitors, adult stem cells, and mature primary cells to engineer organoids (Figure 2). ▲Figure 2. (a) An organ’s microstructure often confers its function. (b) Organs are made of many cellular constituents, which include parenchymal cells (P1, P2), supporting cells (S), and adult stem cells/progenitors (ASC-p). Human pluri­potent stem cell progenitors (PSC-p) can be used in place of ASCs in the creation of organoids. (c) The repeating structural/functional units of organs can be recreated in organoids. As shown in Figure 2, organoids derived primarily from parenchymal cells lack the ability to mimic organ architecture, although they may demonstrate organ function. In contrast, organoids derived from both parenchymal and supporting cells can exhibit organ function and mimic organ architecture. If adult stem cell progenitors from the organ of interest are used, they will give rise to parenchymal cells, but not supporting cells. Thus, the organoids will also be self-renewable, but without supporting cells, they may lack full architecture. If human pluripotent stem cell progenitors (PSC-p) are used together with supporting cells, the PSC-p will give rise to parenchymal cells and supporting cells, and the organoid will retain organ microarchitecture and will be self-renewable. Further, if iPSCs are used, the organoids will be patient-specific and from a single genome. A major problem with organoids is heterogeneity. The use of bioprocessing techniques to engineer organoids more precisely will give rise to more-uniform organoids. Employing principles of morphogenesis and self-assembly modeled by Oster et al. and their colleagues in the 1960s (7), organoids have the potential to recapitulate (i.e., replicate) key structural and functional features of their human organ counterparts (8, 9). The hepatic (i.e., liver), biliary, and pancreatic organ systems participate in complex and essential functions, including digestion and synthesis of macromolecules, production and storage of bile, detoxification, protein synthesis, whole-body metabolism, drug metabolism and elimination, and blood-glucose regulation. Complex functions go hand-in-hand with complex microstructure. Therefore, these related organs represent significant challenges in organoid modeling (2). For example, the liver bears microscopic hepatic cords of single-cell thickness. These hepatic cords are comprised of hepatocytes, the functional cells of the liver, and stellate cells, the supporting cells of the liver. The hepatic cords are bordered on two sides by microscopic vascular channels lined with specialized endothelial cells, called liver sinusoidal endothelial cells (LSEC) (2). Physiological liver functions include albumin and urea secretion, and P450 enzyme activity (involved in metabolism of drugs) (2). The biliary tract (i.e., biliary tree) is responsible for making, storing, and secreting bile. It carries bile from the liver to the gall bladder and eventually the gastrointestinal tract, and is lined by specialized cells called cholangiocytes. The biliary tree is integrated with both the hepatic cords and hepatic vasculature. The pancreas contains a series of branching ducts and glands that produce digestive juices and enzymes. The pancreatic islets are regions within the pancreas that contain its endocrine-producing cells. Highly vascularized pancreatic islets perform many endocrine functions, such as insulin and glucagon secretion. Not surprisingly, organ microstructure is degraded or lost in diseases like liver fibrosis, primary sclerosing cholangitis (which affects the biliary tract), and Type I diabetes and pancreatitis (which affect the pancreas) (10). The term organoid has been used loosely in the field. Here, we define organoids as miniature cell-bearing structures, on the order of 100–5,000 cells, which either contain multiple cell types that correspond to the tissue composition of the target organ or have a 3D structure similar to that of the target organ. Organoids contain primary tissues, hPSCs, or adult stem cells, or some combination of these. Complex epithelial cell types, like the cells discussed in this article, are anchorage-dependent. Interestingly, cultivation formats for organoids typically rely on self-assembly of cells, because they are, in fact, cultured in nonadherent conditions (Figure 3). 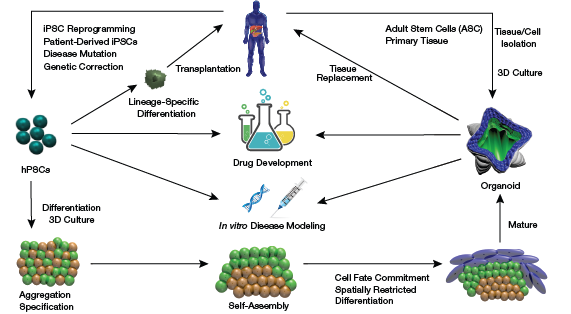 ▲Figure 3.In vitro models of organoids have utilized many different culture techniques to mimic the in vivo environment. Several self-organizing culture approaches have been explored. In these techniques, cells are seeded onto specially treated surfaces and allowed to aggregate over time. Using 3D culture gel-based methods, cell aggregates are then embedded or cultured on top of an extracellular matrix. Would you like to access the complete CEP Article? No problem. You just have to complete the following steps. You have completed 0 of 2 steps. You must be logged in to view this content. Log in now. You must be an AIChE member to view this article. Join now. More in "SBE Special Section"